Tag trailers are deckover trailers with tandem (40K), triple (50K), and quad (60K) axle configurations. These heavily built trailers are available in 20-32’ bed lengths, with several different ramp and beavertail options available, providing the best possible loading solution. 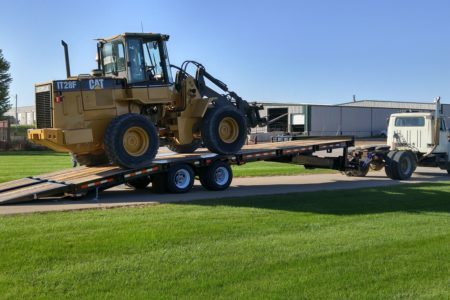 These trailers are built for heavy equipment such as backhoes,crawlers, pavers, etc. Tag Tilts are available in 40,000-50,000 GVWs, with both gravity and air tilt configurations. Both work great for easily loading equipment, with the air tilt offering the lowest possible load angle. All of our tag and tag tilt models are also available with semi-style hitches. Ranging in GVWs from 60,000-100,000 GVWs. Additional semi-style models, such as double drops and paver style trailers are also available. Hydraulic detaches offer the easiest loading solution for equipment requiring a low deck height. Several axle configurations, such as tandem, triple, quad, and flip axles are available. The high tensile construction frame and neck can withstand even the heaviest loads.